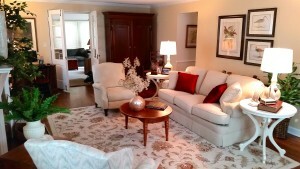 A NEW VIEW IN GLENVIEW - Decor Designs, Inc. 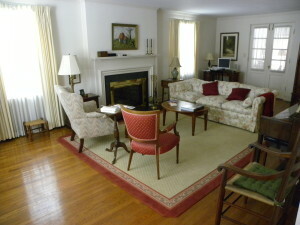 Working with cherished family heirlooms and antiques can be a challenge when updating a space. In order for both new and old to play together nicely, you have to find new pieces that complement and blend rather than fight with the existing ones. We ran into this very challenge on a job we finished recently in Glenview. This empty-nester couple wanted to update and refresh their home while using as many of their history-filled pieces as possible. As with many of our updates, we took advantage of the renovation to began with a fresh coat of paint. 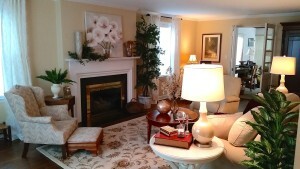 The client selected a warm yellowish cream to compliment the warm woods in the living room. On the day of install, we started by adding a new area rug to break up the long rectangular space and anchor the primary furniture group in front of the fireplace. A new sofa and companion chair in neutral fabrics updated the core seating pieces. The existing wingback chair and ottoman along with two red armchairs will be reupholstered with an update fabrics in the near future. New curtains with a tone on tone print were added as well to soften the edge of the windows and compliment the existing sheer blinds. Next came a pair of new but elaborately carved white tables to compliment the existing antique tables. Adding painted tables to the space helped insure they wouldn’t compete or conflict with the other wood furniture in the room. New matching lamps help balance the room and draw attention to updated but traditional “bird print” artwork above the sofa. A slightly more contemporary oil-on-canvas floral above the fireplace made for a nice departure from all the traditionally framed art everywhere else. Finally we added in the client’s existing chest, console table, occasional tables and accessories and collectibles which blended nicely with and complemented the new additions. 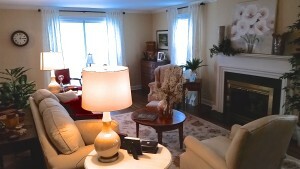 A few new accessories helped update the room and add drama on the coffee table and mantel. 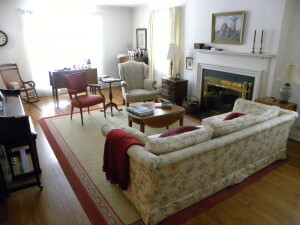 Happy with the living room, we turned our attention to the adjoining dining room which was also due for a facelift. 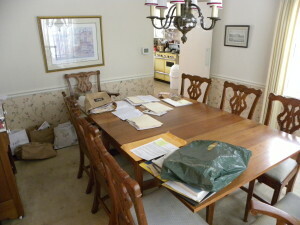 Dated wallpaper was removed and the room was repainted a light taupe. 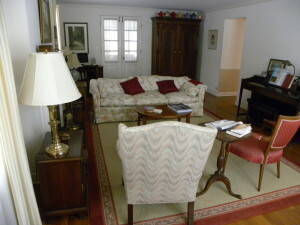 Pinch pleat window panels and a dated area rug were removed to make way for updated replacements. After the new rug and diamond-embroidered window panels were in place, we styled the vintage dining table with a centerpiece created by a printed runner and clear glass cathedral candlesticks of varying heights and styles. 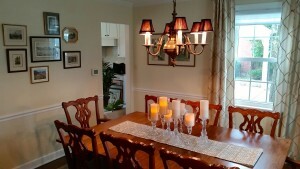 Next, we swapped out the shades on the antique brass chandelier with black to update the look of the old fixture. Finally, a collage of the homeowners vintage travel art was created to complete the space. Mixing the old and new is a great way to update your space for the future while still honoring your past. 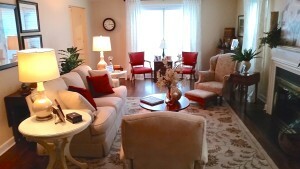 Including cherished heirlooms insures that a lifetime of memories will continue regardless of your ever-changing decor. If you’d like your own view to change mixing old with new, feel free to give us a call. 815-245-2433. Happy Decorating from Decor Designs. This entry was posted in Decor Designs, Inc., Interior Decorating and tagged Decorating Tips, Interior Decorating on April 24, 2015 by Jeff Rice.